UC Berkeley Events Calendar: Five Tables. . .
Drop by the art study centers on Free First Thursday for an up-close look at treasures from the BAMPFA collections, laid out on the five tables in the seminar area. In conjunction with this years Bay Area Science Festival (October 26 through November 11), UC Berkeley scientists give us their take on a nonrandom selection of art from our collections. 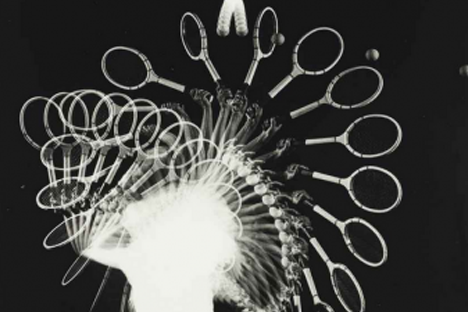 Works on view might include: Harold Edgertons multiflash image of a tennis serve; kites flying high over Mt. Fuji in Hokusais simultaneously soaring and gravity-bound ukiyo-e print; Richard Misrachs long-exposure night view of the temple and star tracks at Sounion, Greece; glorious close-ups of flowers in photos by Papo Colo and Marion Brenner; nineteenth-century cabinet cards of Thomas Henry Huxley, Darwins Bulldog, and much more. Harold Edgerton: Gussie Moran, 1949; black-and-white photograph; 13 5/16 x 11 in. ; BAMPFA, gift of Lewis Zachary Cohen.